Figure. Ventral view of B. anonychus, ventral view of male, 69 mm ML, preserved. Photograph by R. Young. Berryteuthis anonychus is a small, muscular species reaching a maximum size of 150 mm ML (Nesis, 1982/87). This squid has been repeatedly captured by dipnet at the surface at night. 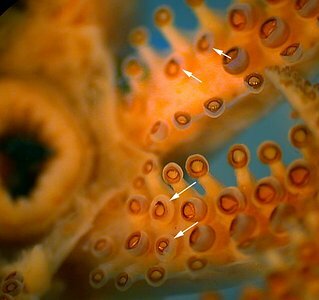 B. anonychus is unusual for a gonatid in lacking nearly all hooks on arms and tentacle clubs. without hooks on arms in males. with few weakly developed hooks at bases of arms I-III in females. 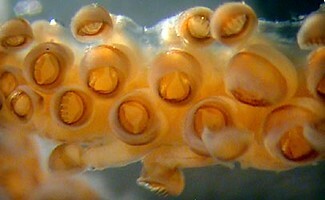 Marginal arm suckers pedicillate; sucker rings with 6-8 truncate, rectangular teeth. Arms of males without hooks; sucker rings in medial 2 rows of basal two-thirds to three-quarters of arms consist of dorsal and proximal lips not distinct and separate teeth. Females with 3 pairs of small, hook-like suckers present in medial rows at proximal region of arms; arm hooks develop at mantle lengths between 35-60 mm ML. Figure. Oral view of arm suckers and hooks of B. anonychus. Left - Medial hook-like sucker, basal portion of arm III, female. Middle - Medial sucker, basal two thirds of arm III, male. Right - Marginal sucker from arm III. Drawings from Pearcy and Voss (1963). Figure. Oral view of arm suckers of B. anonychus, holotype. Photographs by R. Young. Figure. Oral view of arm bases of B. anonychus showing two hook-like suckers near the proximal end of each arm. Photograph by R. Young. Beaks. Descriptions can be found here: Lower beak; upper beak. See also this site. Unidentified structure. In situ observations of B. anonychus indicate that this squid strongly reflects artificial lights near the anterior edge of the eye and base of the ventral arms. 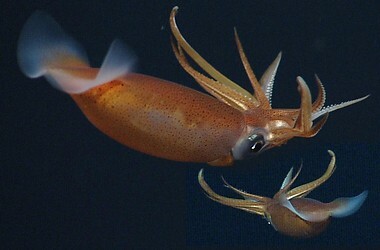 The reflection is noticeable when the squid's anterior or ventral aspect is directed toward the lights. The structures on the squid responsible for this reflection are unknown. Figure. Various views of two B. anonychus showing reflective structures near head. Top left - Ventrolateral view of head. Top right - Anterolateral view of head. Bottom - Ventral view of head. The photographs were taken from an MBARI ROV off Oregon (USA) at depths of 1450 m and 1114 m. Photographs © 2013 MBARI. Information on most characters listed above taken from Pearcy and Voss (1963). More details of the description of B. anonychus can be found here. Paralarvae can be identified by the dorsal-head chromatophore pattern which is Type II,2 (three transverse rows of chromatophores with one chromatophore in the anterior row, two in the middle row and three in the posterior row and two additional chromatophores on the posterolateral regions of the head but are visible dorsally); the mantle has 16-25 dorsal chromatophores (Jorgensen, 2006). Figure. 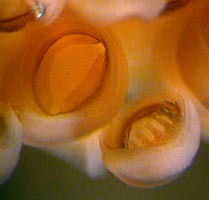 Dorsal views of the chromatophores of a B. anonychus paralarva, 5.5 mm ML, Gulf of Alaska. Left - Head. Note the two additional dark chromatophores on the posterolateral corners of the drawing. 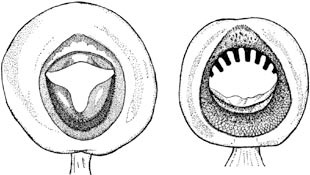 Right - Paralarva. Drawing from Jorgensen (2007). In the posture shown below, which we call a Parachute posture, B. anonychus remains virtually motionless. The orientation of the fins, body, arms and tentacles would seem to produce maximum resistance to sinking. Type locality: Eastern North Pacific Ocean, USA, off Oregon, 45 27.0'N, 125 15.6'W, surface (0 m). Figure. Distribution of B. anonychus. Dark pink area indicates known range; light pink area indicates inferred range. Chart modified from Okutani, et al. (1988). Katugin, O.N., G.A. Shevtsov, M.A. Zuev, A.M. Berkutova and E.V. Slobodsky. 2005. Spatial and seasonal distribution of the squid Okutania anonycha (Pearcy et Voss, 1963) (Cephalopoda: Gonatidae) in the northwestern Pacific Ocean and adjacent areas. Ruthenica, 15(1): 65-79. Nesis, K.N. 1973. Taxonomy, phylogeny, and evolution of squids of the Family Gonatidae (Cephalopoda). Zoologicheskij Zhurnal, 52(11): 1626-1638 [In Russian, with English summary]. Nesis, K.N. 1997. Gonatid squids in the subarctic north Pacific: ecology, biogeography, niche diversity and role in the ecosystem. Advances in Marine Biology, 32: 243-324. Nesis, K. N. (1982). Abridged key to the Cephalopod Mollusks of the World's Ocean. 385+ii pp. Light and Food Industry Publishing House, Moscow. (In Russian.). Translated into English by B. S. Levitov, ed. by L. A. Burgess (1987), Cephalopods of the World. T. F. H. Publications, Neptune City, NJ, 351 pp. Okutani, T., T. Kubodera and K. Jefferts. 1983. 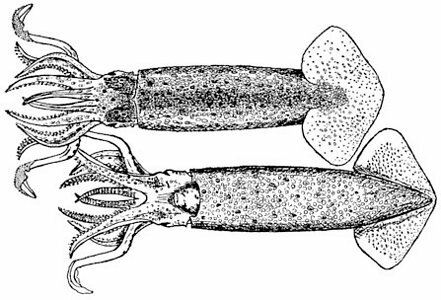 Diversity, distribution and ecology of gonatid squids in the subarctic Pacific: a review. Bull. Ocean Res. Inst., Univ. Tokyo, No. 26 (1): 150-192. Pearcy, W. G. and G. L. Voss. 1963. 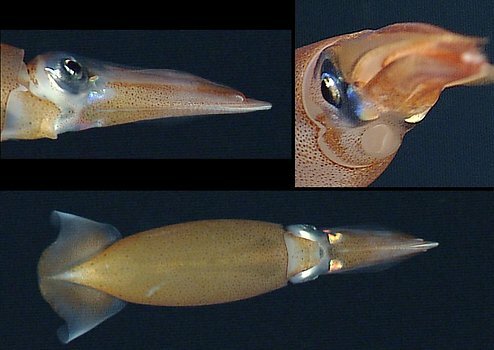 A new species of gonatid squid from the northeastern Pacific. Proc. Biol. Soc. Wash., 76: 105-112. © 1963 Proc. Biol. Soc. Wash. Page: Tree of Life Berryteuthis anonychus (Pearcy & Voss, 1963). Authored by Tsunemi Kubodera, F. G. Hochberg, and Richard E. Young. The TEXT of this page is licensed under the Creative Commons Attribution-NonCommercial License - Version 3.0. Note that images and other media featured on this page are each governed by their own license, and they may or may not be available for reuse. Click on an image or a media link to access the media data window, which provides the relevant licensing information. For the general terms and conditions of ToL material reuse and redistribution, please see the Tree of Life Copyright Policies.